Drs. Neil Busis, Michael Earnest, Gloria Galloway, Thomas Glick, and Orly Avitzur will be participating in this year's AAN Annual Meeting Patient Safety Colloquium, “Your Patients, Your Practice: Preventing Errors and Harm,” on April 25. James D. Reggin, MD, the only child neurologist at MeritCare Health System in Fargo, ND, was called into consultation for an infant delivered 11 days earlier by C-section, now in respiratory distress and intubated, when pediatricians observed persistent hypotonia and a poor sucking reflex. Dr. Reggin noted that the infant displayed dysmorphic features as well as severe microcephaly, syndactyly, and multiple capillary hemangiomas. When he could not pinpoint a specific syndrome, he turned to SimulConsult, a computerized decision-support tool that helps neurologists arrive at difficult diagnoses by entering a list of findings. Despite having been in practice more than 12 years, he had never seen a case of Smith-Lemli-Opitz (SLO), the condition revealed to be a “very high probability” by the program. Prompted by this discovery, he quickly obtained a serum cholesterol level and later confirmed the diagnosis of SLO by finding a marked elevation of 7-dehydroxycholesterol. 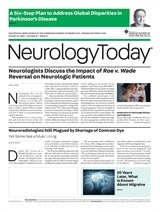 Neurologists are increasingly using decision-support tools such as SimulConsult (www.simulconsult.com) to make diagnoses – and these and other resources improve practice safety. Most EHRs include a complete list of drug formularies available within the US. The drug interaction components check for drug-drug and drug-allergy interactions and provide prescribing alert systems. EHRs also offer searchable medication lists so that in the event of a drug recall or a change in prescribing recommendations, a list of patients maintained on a specific drug may be quickly retrieved. Numerous studies agree that prescribing problems are responsible for many medical errors. According to a seminal study in the Journal of the American Medical Association (1995;274:35-43), the greatest shortcomings are in systems geared to disseminate knowledge about drugs and to make information readily accessible at the point of care. Pharmacy errors as well as mistakes in prescribing, transcription, record keeping, communication, and administration have all been cited in the literature as contributing factors. Like many physicians, Neil A. Busis, MD, Chief of the Division of Neurology and Director of the Neurodiagnostic Laboratory at UPMC Shadyside in Pittsburgh, PA, and founder of MDWisdom, medical applications for handheld computers, uses ePocrates to help avoid drug prescribing errors and drug-drug interactions. ePocrates and other digital drug reference tools also feature photographs of drugs to assist in drug identification. Dr. Busis recently turned to this resource when a patient came in with an altered mental state and a toxicology screen revealed high levels of anticholinergic drugs – even though the patient's medication list had not included any such drugs. Perhaps the most frequent errors occur due to patients' misunderstanding of physician directions, said Gloria Galloway, MD, Associate Professor in the Departments of Neurology and Pediatrics at Ohio State University in Columbus, and member of the AAN Patient Safety Subcommittee. “If patients understand their health care instructions and are not hesitant to ask questions,” she explained, “this knowledge will reduce the chances of medication errors. “We need to take the time to communicate in a manner that allows patients to understand and avoid being intimidated about asking questions,” Dr. Galloway said. One useful technique, she said, is to ask patients to describe the information they understood. “Often information that we thought they understood is incorrect or missing,” she said. This approach may have avoided a well-publicized case recounted by the Institute for Safe Medication Practices (ISMP), www.ismp.org, in which a confused, agitated, and combative patient diagnosed with viral gastroenteritis was admitted to an ER with severe nausea, vomiting, and a reported seizure. It was ultimately discovered that he was taking three different kinds of bupropion at the same time for depression and smoking cessation. All three medications were listed as “active meds” in the physicians' notes with no apparent recognition of the triplication by ER staff, unit nurses, pharmacists, an attending physician, and a consultant neurologist. In particular, the ISMP suggests that patients should be encouraged to keep a medication list with them when they seek care and, when possible, to have their medicines dispensed from the same pharmacy. Although the sooner reports are received by physicians, the better the clinical outcomes, Dr. Feinberg points out that manually tracking abnormal test results can be difficult. “We should all have some system in place to ensure that we receive our reports in a timely fashion and communicate efficiently with our referral base and patients. Thomas H. Glick, MD, Director of the AAN 2004 Patient Safety Colloquium and Associate Professor of Neurology at Harvard Medical School, has conducted detailed analyses of neurologist malpractice claims as part of an initiative of the Harvard Risk Management Foundation. “Legal outcome notwithstanding, we have found that most claims actually do demonstrate lapses in patient safety practices,” he said. Actively practice the prime rule of “First, Do No Harm.” Improve your awareness and pay daily attention to preventing errors. Your commitment to 100-percent safe practice is the first necessary step! On your rounds, look at the patient for safety risks – central lines, isolation, risks of falling, medications being infused, unexpected critical lab results, or other hazards. Improve your knowledge of medical errors, in-hospital injuries, and of new ideas on patient safety (for example, factors related to errors in medication prescribing). Communicate clearly and completely in orders, progress notes, verbal interactions, and e-mails. Choose hospitals for your patients that have a clear commitment to patient safety (for example, those with full-time intensivists, computerized order systems, and active patient safety programs). Participate in the hospital's safety program. If you see an error or risk, report it to Risk Management. Participate in hospital-sponsored patient safety events. Educate your patients about their role in preventing errors or injury to themselves. Participate in professional morbidity and mortality conferences. Analyze the causes of injury and death and work with the hospital staff to develop plans to fix the causes identified. Leape L, et.al. Systems Analysis of Adverse Drug Events. ADE Prevention Study Group. JAMA 1995;274:35–43. Visit www.iom.edu to access the Institute of Medicine reports, To Err is Human: Building a Safer Health System (1999) and Patient Safety: Achieving a New Standard for Care (2003).